Make pastries. Preheat oven to 450 degrees. In a small saucepan, combine the water, milk, butter, and bring to a boil. Remove from heat and add flour, salt and sugar. Stir it in with a wooden spoon until a smooth dough forms and pulls away from the pan, about a minute. Let cool for a minute or two. Beat the eggs into the dough, 1 at a time, beating thoroughly between each one. Transfer the dough to a baggie and cut a hole in the tip. Pipe 2-inch diameter mounds onto the baking sheet, 2 inches apart. Bake for 15 minutes. Reduce heat to 350 degrees and bake another 10 minutes. Turn the oven off and leave pastries in for another 10 minutes. Remove from oven, cool and store in a dry container. Make chocolate sauce. Put all sauce ingredients in the blender and blend for about 30 seconds. Store in the fridge in a container that is microwave safe for heating. I use a glass jar. 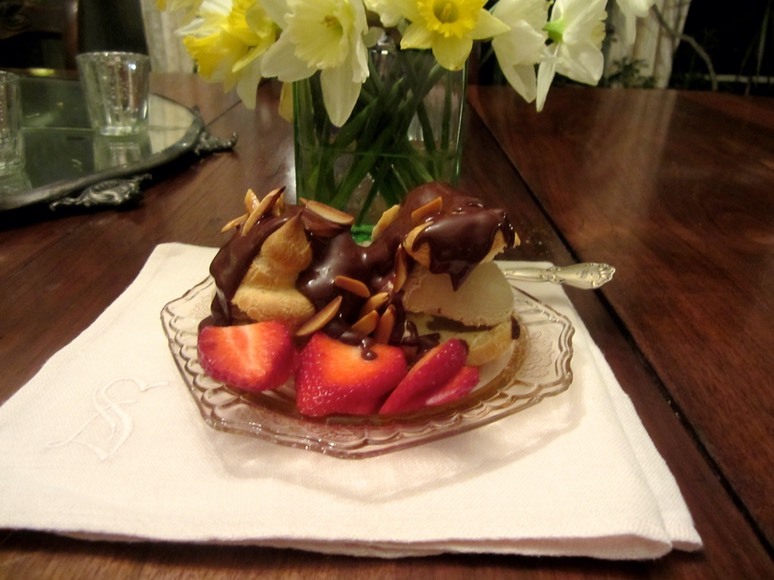 To serve: Split cream puffs in half and add a scoop of ice cream to each. (2 puffs per person). Replace tops and pour warmed chocolate sauce over the top.